Dean Harrison (Silicone Engineering Kawasaki) at Ballaugh Bridge during TT qualifying on Saturday evening. Bradford’s Dean Harrison grabbed the top spot during Supersport practice as the 2016 Isle of Man TT roared into life on Saturday evening. 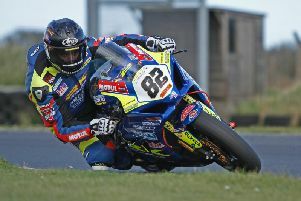 Ballymoney pair William Dunlop and Seamus Elliott were among the fallers, with Dunlop off at Sarah’s Cottage and Elliott crashing out at Hailwood Heights, both fortunately escaping injury. Silicone Engineering Kawasaki rider Harrison clocked 124.218mph (18:13.467) on his sixth and final lap of the session to head Bingley Bullet Ian Hutchinson (Came BPT Yamaha), who won both Supersport races in 2015. Hutchy lapped at 124.16mph while Michael Dunlop was also into the 124mph bracket as the 11-time TT winner set his best speed of 124.16mph on his MD Racing Yamaha. In perfect conditions around the Mountain Course, Morecambe’s John McGuinness was fourth fastest on the Jackson Racing Honda (123.42mph) ahead of Manxman Conor Cummins on the Valvoline Padgett’s Honda, who clocked 123.35mph. Bruce Anstey rounded out the top six on the second of Clive Padgett’s machines with a speed of 122.65mph, followed by Burton-on-Trent’s Peter Hickman on the Trooper Beer Kawasaki (121.49mph) and Steve Mercer (Jackson Racing Honda), who managed 121.47mph. Two-time Supersport TT winner Gary Johnson from Lincolnshire lapped at 120.84mph on the T3 Racing Triumph while James Hillier (Quattro Plant Muc-Off Kawasaki) completed the top ten with a lap of 119.47mph. Meanwhile, reigning Lightweight TT champion Ivan Lintin was quickest on the Devitt RC Express Kawasaki during the opening session for the 650cc machines, clocking a speed of 116.773mph. Lintin was followed by 2013 winner Hillier (114.341mph), James Cowton (113.227mph) and John Barton (112.213mph). The session began with the speed controlled newcomers lap at 6.20pm and TT Rider liaison officer Richard Quayle led Alessandro Polita, Michael Booth, Seamus Elliott and Jochem van den Hoek around the course for their first closed road lap. Flying Kiwi Anstey, who rode the Valvoline Padgett’s Superstock machine and not the MotoGP-based RCV213V-S, escorted Josh Daley, Andre Pires and Forrest Dunn while rider liaison officer John Barton took the final group of Darren James, Olaf Romijn and Alastair Fagan. Other accidents on Saturday involved Ben Rea (Lambfell) and Forrest Dunn (Waterworks), who were also unhurt. Practice continues on Monday evening from 6.20pm.